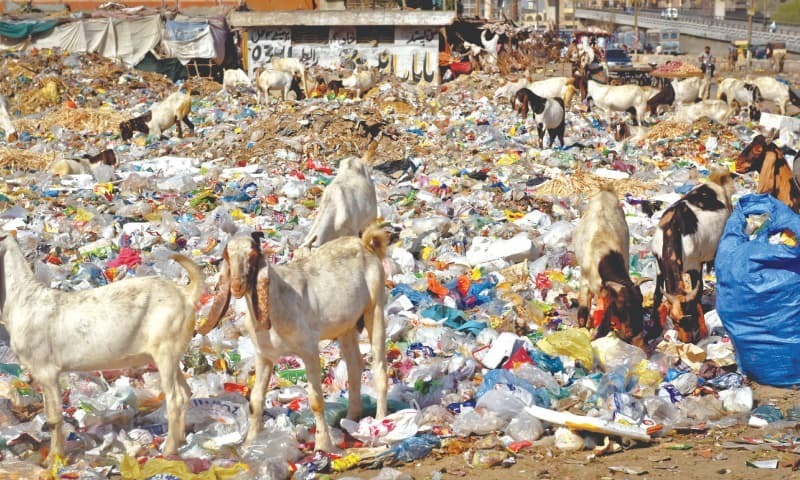 Pakistan Dumps 8 Million Tons Of Plastic A Year. I Went To Learn More About This Ticking Time Bomb. When we think about environmental issues, we know for a fact that the Earth has become a ticking time bomb. It’s convenient to think this will impact a future generation, but if there’s anything I learned by attending WWF Pakistan’s #BeatPlasticPollution event, it’s that the time to take action is now. With this in mind, I headed out on a Sunday to Dolmen Mall Clifton, where the team had set up a stall. I did, of course, Snapchat the entire thing on MangoBaaz’s account, so I do have videos of what went down at the event. Now, upon reaching, I noticed a cute little stall with a bunch of bottles in transparent containers. There were already plenty of bottles there, so I figured this had been going on for a while. Upon inquiring, I found that the team had collected quite a lot of bottles over the course of the activity. Okay, so basically, you could put 3 bottles into the container to get a chance to Spin The Wheel and win a prize. I understood, of course, that the prizes were a hook to get people to care enough to dump bottles that would otherwise be found lying around. There was a bit of bittersweet tinge to it all. At the end of the day, it was kind of disheartening how an incentive had to be presented in order for us to do the bare minimum. Regardless, people were legit showing interest. They’d come, dump bottles, spin the wheel, collect their prize and leave. Even a little baby was there to do the same. As time passed, I managed to meet the Regional Director, Dr. Babar Khan, too. I spoke to him, he filled me in about WWF Pakistan’s plan of action and why they were doing what they were doing. …he spoke a bit about what it is that WWF Pakistan does. Just to give everyone else a bit of background here, too: WWF Pakistan was formed in 1970. The main aim has always been – as Dr. Babar also explained – to spearhead projects around conservation and to tackle the various environmental issues that plague Pakistan. With an average of 30 active projects in Pakistan so far, the organization shows no signs of stopping and has, since its inception, come a long way. The best part was how they, too, were actively contributing to the activity, thereby setting an example for others as well. Shortly after, a HUGE crowd had started gathering. People came prepped with their bottles. It was actually pretty great to see that Karachiites were all set to support a good cause. While I was prepping to leave, I got a goodbye message from Maha who said the initiative would continue till the 14th of August. How does this impact us directly, though? Owing to a large amount of plastic waste, the chemicals within get released into the water. In turn, marine life – including the fish we consume – become contaminated. In this way, the chemicals from plastic pollution directly impact the food chain. Numerous toxins are ingested by marine life. And we, in turn, consume much of this marine life too. The toxins plastics carry are directly linked to numerous diseases, such as cancer. They can compromise our immune system and cause birth defects and childhood developmental issues. Stop buying bottled water. We’ve all got those flasks/glass bottles sitting at home. They’re reusable and refillable. We can all use em’. Switch to shopping bags that aren’t made of plastic, or just carry your own non-plastic bags. Again, you can reuse them and this tiny step will go a long way. Skip the usage of straws. Matlab, how important are straws to you, truly? Wohi drink normally bhi pee ja sakti hai. Straws are completely unnecessary and they gotta go. Reuse containers for storage that aren’t made of plastic – like glass jars. These are just SOME of the things we can do. Of course, while we’re starting small, there’s plenty more that can be done on a larger scale. And that’s why we need organizations like WWF Pakistan – to help us see how. Because, here’s the thing: the Earth IS a ticking time bomb, but let’s not pretend we’re not to blame, for we truly are. Let’s take responsibility and change the current narrative. Therefore, we need more of such campaigns that raise awareness and distribute accountability and responsibility, while doubling as modes of learning. You can read up more about WWF Pakistan, their future ventures and their fight against plastic on their website. At the end of the day, with all this in mind, we have to ask ourselves – are we doing our part?